Women in Harmony and VoiceMale. The money raised has been shared between Ton Yr Ywen School, who entertained us last year and Birchgrove School. being presented cheques for £250 by committee members of the Association. Birchgrove are to buy new musical instruments whilst Ton Yr Ywen are purchasing netball posts. We wish them the best for the future. 149 HEATHWOOD ROAD - NEW PLANNING APPLICATION. A Great Success! A Wonderful Evening! The committee would like to thank you for the support you gave in attending the Carol Service. It was a most enjoyable evening and we have sent out thanks to Rev. Trystan Hughes, Ton Yr Ywen School and the Cardiff Arms Park Male Voice Choir.As a result of ticket sales and donations we are able to spend five hundred pounds on an item of equipment selected by the Children's Hospital at the University Hospital of Wales. We will keep you up to date on this matter. We would also like to thank you for your generosity in giving clothing. Adrian, who's company, Printing Wales, together with members of St.Dyfrig's Church will distribute them to the homeless before Christmas. He was quite overwhelmed by the amount of clothing and can assure us that this will go to help those less fortunate. The Chair and committee wish you a peaceful and Happy Christmas. We would like to thank our members for the considerable help they have given in objecting to the planning application. The objections have been registered and will be taken into consideration as will the petition which was signed by over 500 people. to be held in room 4 at the County Hall, Atlantic Wharf, Cardiff. It is important now that our Association continues to show that they object to the planned development by attending the Planning Committee hearing. Please make an effort to attend as this is important for the whole area. Lakeside Developments have submitted a planning application (15/00867/MJR) to demolish a large detached house at 149 Heathwood Road and replace it with 7 flats and 7 cottages for the purpose of letting. The applicant has now submitted an amended application to build 9 flats, some of which will have two bedrooms. The layout of the building will change and this can be seen online by visiting Cardiff Council Planning. Those of you who sent in objections will be notified of this change. Click here to see the latest planning documents. This afternoon (Wed 12th August) Cardiff Council planning committee unanimously refused the planning application for the demolition of 149 Heathwood Road and the construction of flats. The council planning officers had decided that the application should be refused and this was put to the planning committee. Local neighbouring residents and other HRA members attended the meeting and had the opportunity to address the planning committee. Councillors Graham Hinchey and Lyn Hudson together with John Jones (chairman of the Heath Residents Association) spoke on their behalf. Much of the success was due to the hundreds of signatures on a petition together with the very large number of emails and postal letters sent objecting to the application. Thanks to everyone who took part. We hope that common sense has prevailed and that the matter is closed. 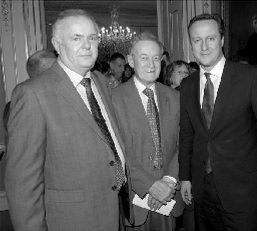 Our Chairman, John Jones, attended 10 Downing Street on Monday 19th January, 2015, at the invitation of the Prime Minister, David Cameron and as a representative of Heath Residents’ Association. Invitations had been sent out to many people throughout the country who are engaged in community work. Mr. Cameron recognised the work of the various organisations present and praised the contribution that people play in looking after and enhancing their community. Members of the Association should be proud to be recognised in this way.Bill Farnham, the chairman of Neighbourhood watch in South Wales, was also present.